Katie Crocker (center), a sophomore finance major, networks after presenting her idea for a campus safety app. More than a hundred Loyola alumni joined Ignite Lab members, faculty, and staff on Oct. 16 to celebrate the launch of Ignite Lab, a program that supports entrepreneurship at Loyola. Attendees enjoyed networking and refreshments before five speakers took the microphone to begin the program. Here are four key takeaways from the event. 1. Loyola entrepreneurs are clamoring for Ignite Lab’s services. Dean Kevin T. Stevens believes Ignite Lab is fundamental to jumpstarting the Loyola community’s business ideas. He even made a comment about the number of alumni he has spoken to that wish they would have had access to Ignite Lab when they were students. 2. Chicago’s entrepreneurial community welcomes Ignite Lab. Kevin Willer, founding chief executive officer of 1871, is happy to see Loyola embracing the entrepreneurial spirit. Willer believes Chicago is a hub for entrepreneurship. When he originally launched 1871, Chicago’s leading entrepreneurial hub for digital startups, he faced a number of challenges, but now he says the community is thriving. 3. Even in its early stage, Ignite Lab has impacted student entrepreneurs. Katie Crocker, a sophomore finance major, presented her idea of a campus safety app she envisioned to help keep students safe. Crocker worked with the First-Year Research Experience (FIRE) program to develop the app and utilized Ignite Lab to help with incorporation through the Business Law Clinic. Her next step is to work with Loyola Campus Safety to conduct a pilot test. Jeffery Wagman, an entrepreneurship major who graduated in May, presented his plan for Kaathy, a business he launched in order to help families simplify the funeral process. Under the mentorship of Ignite Lab, Wagman was able to determine the scope of his business, benefit from mentors, connect with professionals, and understand how to grow his business. Most importantly, perhaps, is that Ignite Lab provided the necessary accountability he needed to help get Kaathy to the beta-testing phase. 4. Alumni are invited to get involved. Uğur Uygur, Loyola entrepreneurship professor and founding director of Ignite Lab, encouraged alumni to help foster entrepreneurial creativity by serving as mentors, speakers, and workshop facilitators. 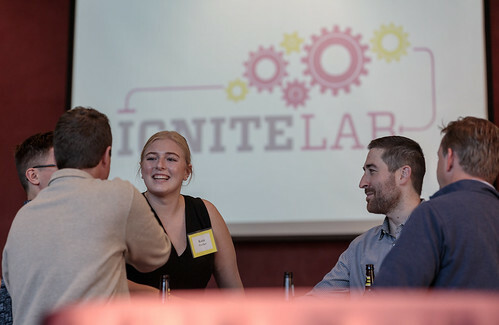 Interested alumni should email Ignite Lab at ignitelab@luc.edu. Students interested in joining Ignite Lab can apply here. View photos from the Alumni Unveiling of Ignite Lab in the gallery below or on Quinlan’s Flickr page.